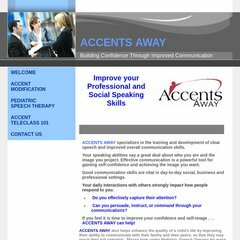 Topics: Accent Modification, and Speech Therapy. Monstercommerce Llc (Illinois, Belleville) is the location of the Apache/2 server. Accentsaway.com's IP address is 206.188.192.252. There are 2 Nameservers, ns35.worldnic.com, and ns36.worldnic.com.